Syzygium jambolana , (Lam.) DC. 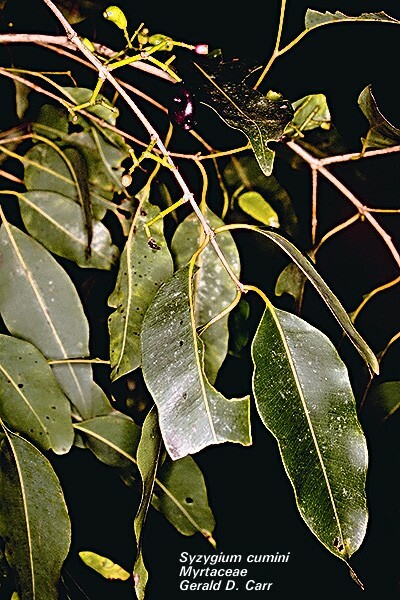 Syzygium caryophyllifolium , (Lam.) DC. Syzygium jambolanum , (Lam.) DC. Calyptranthes caryophyllifolia , (Lam.) Willd. Syzygium cumini has been introduced to many different places where it has been utilised as a fruit producer, as an ornamental and also for its timber. It has the ability to form a dense cover, excluding all other species. This characteristic has allowed Syzygium cumini to become invasive in Hawaii where it prevents the re-establishment of native lowland forest and very invasive in the Cook Islands and in French Polynesia. This tree has not been evaluated for biological control, but vigorous efforts to exterminate it with herbicides are taking place in Hawaii. \"The jambolan is fast-growing, reaching full size in 40 years. It ranges up to 100 feet (30m) in India and Oceania; up to 40 or 50 feet (12-15m) in Florida; and it may attain a spread of 36 feet (11m) with a trunk diameter of 2 or 3 feet (0.6-0.9m). It usually forks into multiple trunks, a short distance from the ground. The bark on the lower part of the tree is rough, cracked, flaking and discoloured; further up the trunk it is smooth and light-grey. The turpentine-scented evergreen leaves are opposite, 2 to 10 inches (5-25cm) long, 1 to 4 inches (2.5-10cm) wide; oblong-oval or elliptic, blunt or tapering to a point at the apex; pinkish when young; when mature, leathery, glossy, dark-green above, lighter beneath, with conspicuous, yellowish midrib. The fragrant flowers, in 1to 4 inches (2.5-10cm) clusters, are 1/2 inch (1.25cm) wide, 1 inch (2.5cm) or more in length; have a funnel-shaped calyx and 4 to 5 united petals, white at first, then rose-pink, which quickly shed leaving only the numerous stamens. In southern Asia, the tree is venerated by Buddhists, and it is commonly planted near Hindu temples because it is considered sacred to Krishna. The leaves and fruis are employed in worship, (Morton, J. 1987). It is not really fire resistant, but fires are rarely intense enough in the stands to produce other than peripheral damage, (Smith, 1998). Jambolan fruit can be eaten raw and can be made into tarts, sauces and jams. Good quality jambolan juice is excellent for sherbet, sirup and \"squash\", an Indian drink. In Goa and the Philippines, jambolans are an important source of wine, somewhat like Port, and the distilled liquors, brandy and \"jambava\" have also been made from the fermented fruit. Can also be made into Vinegar. The jambolan tree is of real value in apiculture. The flowers have abundant nectar, and the honey is of fine quality. The leaves have served as fodder for livestock and as food for tassar silkworms in India. In Zanzibar and Pemba, the natives use young jambolan shoots for cleaning their teeth. The essential oil distilled from the leaves is used to scent soap and is blended with other materials in making inexpensive perfume. Its chemical composition has been reported by Craveiro et al. in Brazil. It consists mainly of mono- or sesqui-terpene hydrocarbons which are \"very common in essential oils.\"
Jambolan bark yields durable brown dyes of various shades depending on the mordant and the strength of the extract. The bark contains 8 to 19% tannin and is much used in tanning leather and preserving fishing nets. When kiln dried, the heartwood is hard, difficult to work but polishes well. It is durable in water and resistant to borers and termites. In India, it is commonly used for beams and rafters, posts, bridges, boats, oars, masts, troughs, well-lining, agricultural implements, carts, solid cart wheels, railway sleepers and the bottoms of railroad cars. It is sometimes made into furniture. In its area of distribution, the absolute maximum shade temperateur varies from 2.5o to 17.5oC. The mean daily maximum temperature in May which is the hottest month of the year, varies from 30o to 43.5oC, and the mean daily minimum temperature in the coldest month i.e. January varies from 5o to 23.9oC (Luna, 1996). The panicles of small, greenish-white, sweet-scented flowers appear from March to May, the fruits are green at first; as they develop, turn pink and then finally purple –black at the time of ripening in June to August (In India). Fruit formation takes place about 32 days after flowering. The fruits are devoured by frugivorous birds, monkeys, squirrels and human beings, perhaps occasionally by feral pigs (Sus scrofa) therefore widely dispersed. Natural regeneration is profuse around the mother trees as the seeds fall in large quantities. Germination takes place on moist ground, each fruit may produce from one to four or even five seedlings clustered together in dense masses. Sometimes, seedlings of different years may be found under the same seed bearer, showing their degree of tolerance to shade. The seedlings are somewhat frost-tender, particularly on grassy ground, where they are frequently killed back. The natural reproduction of the species is helped by fire protection. Weeding has a marked effect on the growth and vigour of seedlings. (Luna 1996). Seeds loose viability quickly (Coronel 2001). Principal source: Morton, J. 1987. 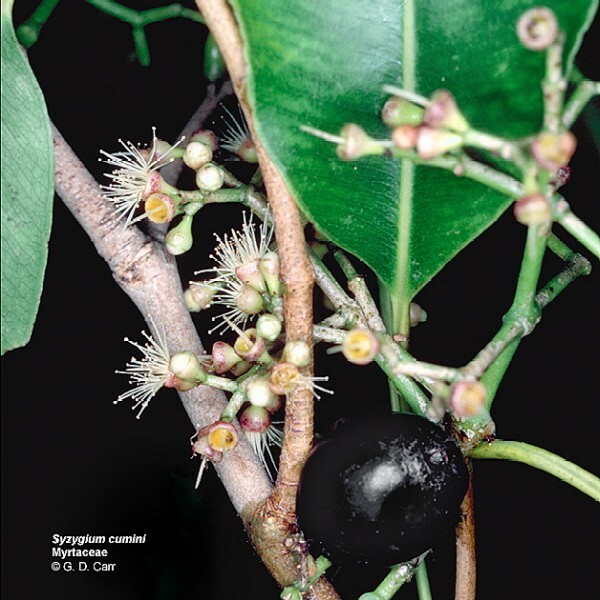 Recommended citation: Global Invasive Species Database (2019) Species profile: Syzygium cumini. Downloaded from http://www.iucngisd.org/gisd/species.php?sc=505 on 21-04-2019. This tree has not been evaluated for biological control (Smith, 1998), but vigorous efforts to exterminate it with herbicides are taking place in Hawai‘i (Morton, J. 1987). Informations on Syzygium cumini has been recorded for the following locations. Click on the name for additional informations. PIER (Pacific Island Ecosystems at Risk), 2002. Syzygium cumini. Available from: http://www.hear.org/pier/species/syzygium_cumini.htm [Accessed 6 March 2003]. Coronel, R.E. 1991. Syzygium cumini (L.) Skeels. In Verheij, E.W.M., Coronel, R.E. (Eds) Plant Resources of South-East Asia No. 2. Edible fruits and nuts, pp. 294-296. Pudoc, Wageningen. Florence J. Chevillotte H. Ollier C.& Meyer J.-Y. 2007. Syzygium cumini. Base de donn�es botaniques Nadeaud de l Herbier de la Polyn�sie fran�aise (PAP). Summary: Description, ecology, Distribution and life history of the Jambolan. A good overview. Luna, R.K. (1996) Plantation trees. International Book Distributors, Dehra Dun. Morton, J. 1987. Jambolan. p. 375�378. In: Fruits of warm climates. Miami, FL. Summary: Description, Distribution, Ecology, habitat, varieties, climate and information on Pests and Diseases that effect Syzygium cumini. Considerable information on the uses of the plant. Found at: http://www.hort.purdue.edu/newcrop/morton/jambolan.html [Accessed 6 March 2003]. Whistler, 1995. Wayside plants of the islands. Everbest Printing company, Ltd. Hong Kong. Summary: Description, and brief summary of the plants history.